But behind the gates of England's grandest estate lies a power that could break the world. Abi is a servant to England's most powerful family, but her spirit is free. So when she falls for one of their noble-born sons, Abi faces a terrible choice. Uncovering the family's secrets might win her liberty—but will her heart pay the price? 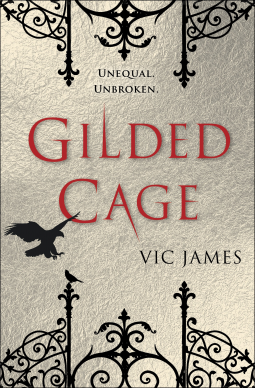 Gilded Cage is the first novel of Vic James' Dark Gifts series. The fantasy series follows a cast of characters on different sides of a political battle. In this alternate Britain, aristocrats with special powers, or Skill, rule over ordinary, Skilless, people. The commoners must spend 10 years of their lives as slaves to the aristocrats. There are few of the aristocracy who would see the slavedays law abolished, but the majority revel in the power of their society. I had high expectations of Gilded Cage, but unfortunately they were not met. I wasn't immediately hooked into the story and instead read on hoping for something to grab me. Gilded Cage is like a foundation story. The parameters of the world are established and the main players of the story are pinpointed, and that's the most this story accomplished. I expected to be able to connect to the characters who were oppressed and had a reason to fight for their freedom, or fight for the safety of their family. However, the characters were one dimensional and not impressive, like Luke and Abigail. I thought they were going to be the sparks to ignite revolution. Instead, they let others manipulate and prod them into actions that were thwarted or amounted to more trouble. Though I appreciate the fast pace of the plot and the efforts to add action and excitement, it wasn't enough to make me want more. I walk away from Gilded Cage unsatisfied and strangely unmoved. It's rare that I find myself unhappy with a fantasy read, but Gilded Cage just didn't do it for me. Enter the Harlequin Valentine's Day Giveaway!